In August 2008, Bloomberg News accidentally published a seventeen-page obituary for Steve Jobs. The text included a list of people to call for quotes in the event of his death, including Al Gore, Bill Gates, an ex-girlfriend, and the California attorney general. A man who has been called “too busy to flush toilets,” Jobs was the young Silicon Valley wire-head who cofounded Apple in his parents’ garage in 1976. 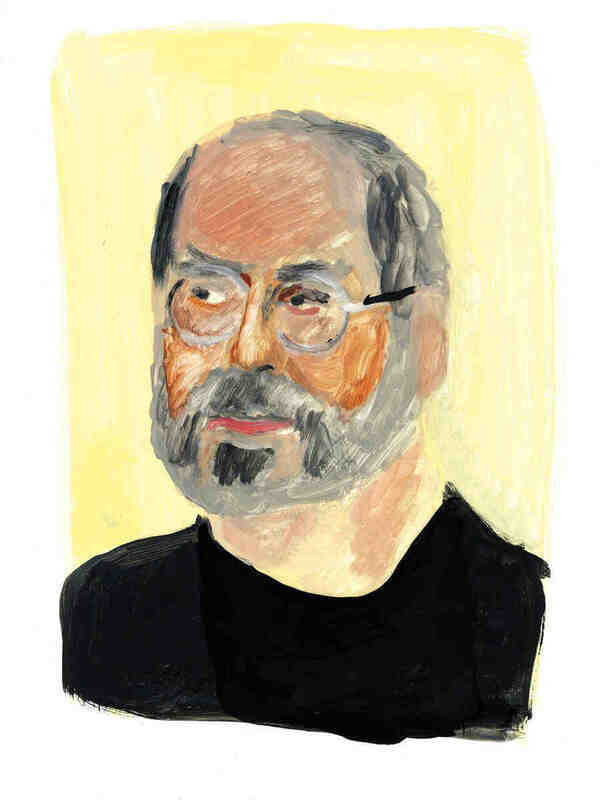 Worth $5 billion today, Jobs has helped mould mainstream culture, profited from it, and held stubbornly fast to his vision of the world. Understanding both electronics and desire, Jobs realized that high technology could be designed, packaged, and sold as a lifestyle choice as much as a consumer product. 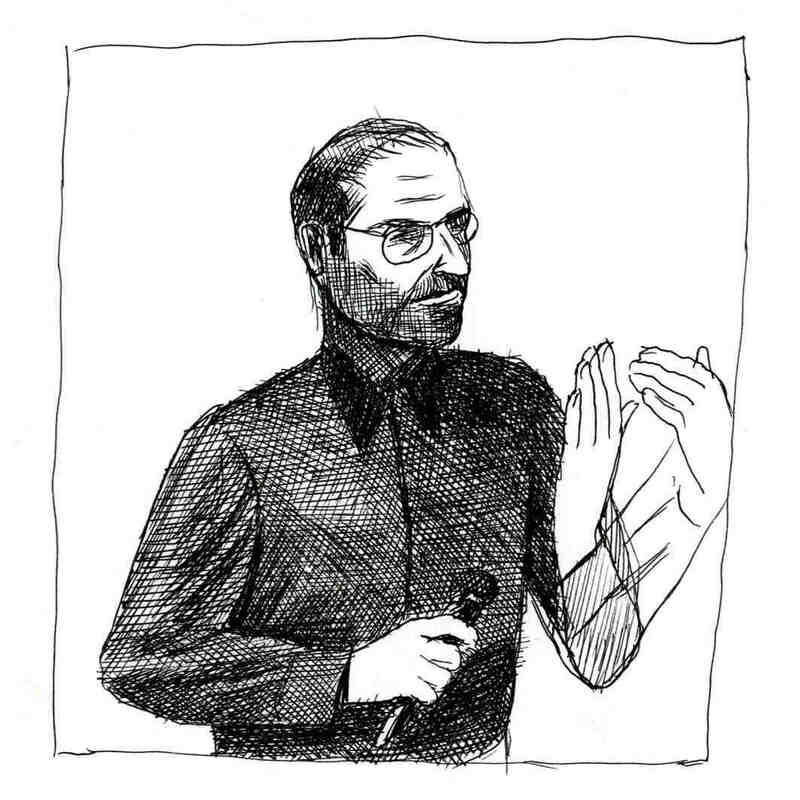 In his black mock turtleneck, Levi’s 501 jeans, and size fourteen New Balance sneakers, Jobs is an unlikely celebrity, even as he delivers his “Stevenote” speeches at the Macworld Expo, year after year, to thousands of Apple groupies. It is often said that Jobs is surrounded by a “reality distortion field” — a haze of charisma, rhetoric, and indomitable will that can convince anyone of anything. In the Jobs distortion field, phones become iPhones, life becomes iLife, and for everything, there is an app. Jobs named his company after the Beatles’ record label; the slogan for Apple became, “Byte into an Apple.” A Buddhist vegetarian, Jobs spent time in a hippie commune in Oregon where he only ate apples. At the first Apple Halloween costume party, Jobs dressed up as Jesus. He once went on a blind date with Diane Keaton, and famously went out with Joan Baez. In 1969, fourteen-year-old Jobs met computer whiz Steve Wozniak, or “Woz,” in a neighbor’s garage; at the time, Woz was at work wiring his “Cream Soda Computer,” named for his favorite soft drink. Though Woz was four years Jobs’ senior at Homestead High, they instantly connected over a shared love of microprocessors and pranks, and cemented their friendship by constructing a huge middle finger on the roof of their high school. The pair became phreaks — phone hackers who were able to call all over the world for free by playing certain tones into a telephone receiver. Jobs and Woz had been taken under the wing of John Draper, also known as “Captain Crunch,” who had discovered that the toy whistle included in select boxes of Cap’n Crunch cereal emitted the perfect frequency to hack into AT&T’s systems. Jobs and Woz capitalized on the trick, manufacturing and selling home-phreaking kits called “blue boxes” out of Woz’s University of California, Berkeley dorm room for $150 apiece. Steve Jobs was born on February 24, 1955 to Joanne Carole Schieble and Abdulfattah Jandali; both were twenty-three-year-old, unmarried graduate students at the University of Wisconsin at Madison. Abdulfattah, who goes by John, was born in 1931 in Homs, Syria, into a prominent Syrian Muslim family. 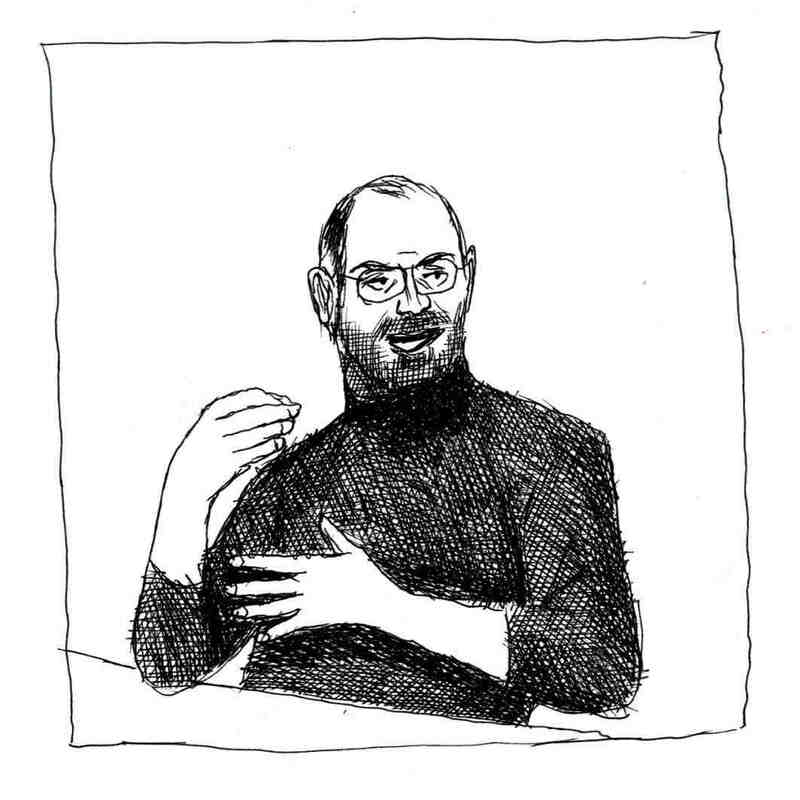 (The revelation of Jobs’ paternal origins has led many a Syrian on internet chat groups to play “Six Degrees of Steve Jobs.”) Jandali went to college at the American University of Beirut in 1949 and started a doctoral program in political science at Madison in 1953, where he met Joanne, a master’s student in children’s speech development. Joanne Schieble’s family owned a mink farm in the Green Bay area in Wisconsin; today, the site houses a Walmart. When Schieble became pregnant in 1954, she and Jandali went to San Francisco to have the baby. A week later, they put up Jobs for adoption with the stipulation that his new parents be college graduates. In the end, though, the infant was taken in by Paul Jobs, a tattooed mechanic who had dropped out of high school, and Clara Hagopian, an Armenian American from New Jersey who’d dropped out of college. (Jobs’ mother refused to sign the adoption papers unless they promised that Jobs would go to college.) Incidentally, the future college dropout would also father an illegitimate child at the age of twenty-three. For years, Jobs denied that he was the father of Lisa, leaving his high-school girlfriend, Chris-Ann Brennan, to raise the baby on welfare while he made his first hundred millions. According to friends of the Schiebles, Joanne’s father threatened to remove his daughter from his will if she married Jandali. Soon after this proclamation, however, Mr. Schieble passed away, and four months later, Schieble and Jandali wedded. They had a second child in 1957, the future novelist Mona Simpson, who did not learn of her brother’s existence until she was twenty-five-years-old. By then, Jobs was worth $150 million and had already been on the cover of Time. Having completed his doctorate, Jandali became a professor of political science at Michigan State University. Yet after three semesters, he abruptly quit and vanished into the Middle East, abandoning wife, daughter, and career. Schieble and Jandali officially divorced in 1962 while Jandali was back in Syria. Over the next few years, he worked with Palestinian refugees at the UN in Beirut, and in 1967 moved back to the States to take a job as an assistant professor in political science at the University of Nevada. In 1969 Jandali delivered the paper “Some Contemporary Aspects of Arab Foreign Policy” at an academic conference in Hawaii. Now nearly eighty-years-old, Jandali is still in Nevada, living in Reno — at least, he is according to Facebook. 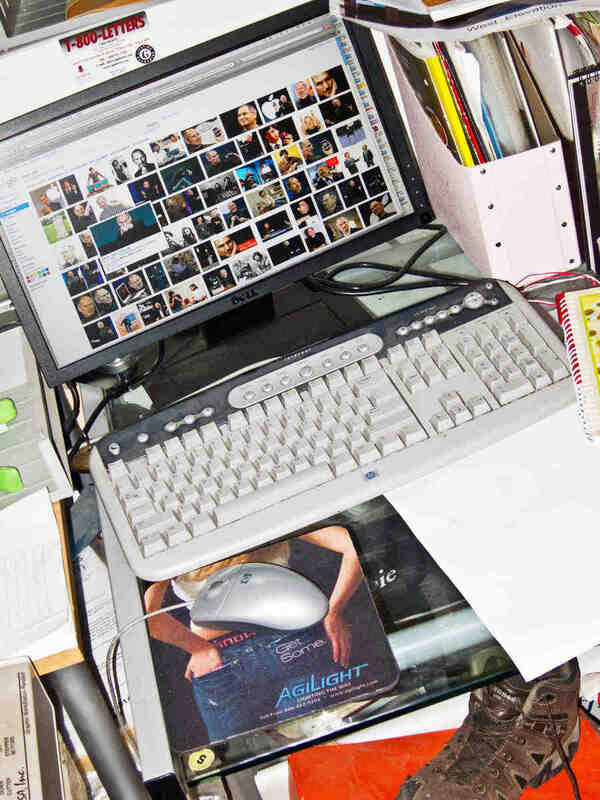 It is unknown whether he uses a Mac or PC. He works as the director of food and beverage for the Boomtown Reno Casino, which boasts an all-you-can-eat lobster buffet.